In order of appearance from left to right, Cyrus Zargar, Muhammad Faruque, Sayeh Meisami, and Nicholas Boylston. 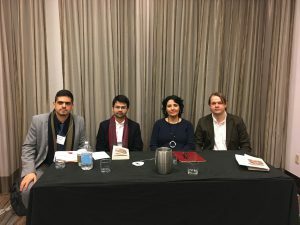 The Society for the Study of Muslim Ethics held a panel discussion on Dr. Cyrus Ali Zargar’s recent book, The Polished Mirror: Storytelling and the Pursuit of Virtue in Islamic Philosophy and Sufism (London: Oneworld, 2017). The panel, convened by Betsy Mesard of John Carroll University, comprised Sayeh Meisami (University of Dayton), Muhammad Faruque (UC Berkeley and Harvard University) and Nicholas Boylston (Harvard University). Zargar is the of Al-Ghazali Distinguished Professor in Islamic Studies at UCF. The position was created through donations from hundreds of members of the Islamic Center of Orlando, allowing UCF to build an Islamic Studies program through speakers, events, and new vehicles for interfaith dialogue, with the overall effect of promoting the understanding and appreciation of Islam and Muslim communities. The Society for the Study of Muslim Ethics is the first association dedicated to the academic study of ethics in Islam. They hosted their 11th annual meeting in Louisville, Kentucky.